By any means necessary Californians, local, state and Federal elected officials stand in unity of resistance to the new presidential administration. 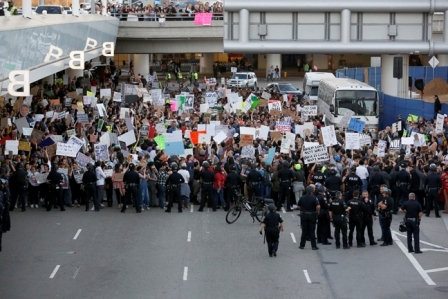 For the second week in a row California has stood in unity with a very distraught nation as Donald Trump continues to cause mayhem in US government. In just two weeks the Trump Klan has stripped women’s rights, stripped oil from scared Indian land, repealed Obamacare (Affordable Healthcare Act), attempted to impose a border wall on US taxpayers, muzzled government workers, rejected climate change, courted Putin and appointed White Nationalist Stephen Bannon, as a regular committee member of the National Security Council. While most of America is seething, Republicans in Congress publicly and silently approve. However, no other state has made such an opposing reaction to the mayhem like California. 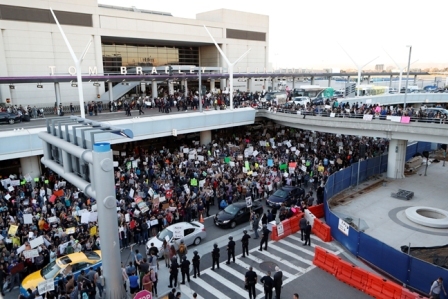 On Sunday, January 29, Congress member Maxine Waters joined thousands of protesters at LAX Tom Bradley International Airport in protest to an amateur attempt of government, as Trump signed an executive order to ban Muslims for 90 days from seven countries with terrorist ties. The ban is not as troubling but rather the disregard of humanity as the way it was enforced and carried out. 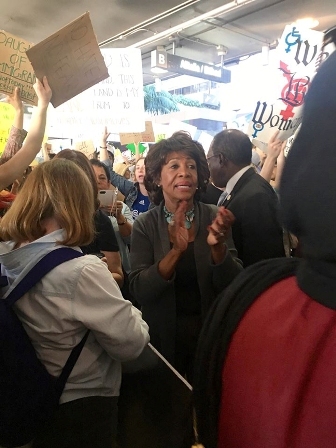 Waters credited the demonstrations with helping to drive the Democratic message as she walked among protesters in support and checked on the status of detainees at LAX. She went on to share, “the only way to stop this president and his appointees is for United States citizens to step up to the plate”. She encouraged the crowd to keep fighting, keep rallying as she headed back to Washington DC to do her part on Capitol Hill introducing legislation urging an investigation of president Trump’s ties to Russia and cyberattacks. The introduced legislation demands congressional investigations into Russian interference in the 2016 election including a thorough review of any collusion between persons associated, formally or informally, with Donald Trump and the Russian government. Meanwhile California state legislators held an initial hearing on a bill known as the California Values Act that would make the entire state a sanctuary for undocumented immigrants, in defiance of Trump’s plans to deport millions of people. The state of California is also studying ways to suspend financial transfers to Washington after the Trump administration threatened to withhold federal money from sanctuary cities. California is among a handful of so-called “donor states,” which pay more in taxes to the federal Treasury than they receive in government funding, according to the non-profit think tank Tax Foundation. In the highest form of a resistance gesture CalExit has reemerged. Supporters of the so-called “Calexit” movement got the green light from the California Secretary of State to begin collecting voter signatures needed to get the initiative on the November 2018 ballot. The proposed Calexit ballot measure seeks to repeal provisions in the state's constitution “stating California is an inseparable part of the United States and that the United States Constitution is the supreme law of the land,” according to wording approved by the California Attorney General. The group needs 585,407 signatures from registered voters over the next 180 days to qualify for the ballot. If that wasn’t enough Democratic leaders of the California Legislature hired Eric H. Holder Jr., who was attorney general under President Obama, to represent them in any legal fights against the new Republican White House. The agreement will give Holder, leading a team of attorneys from the firm Covington & Burling, a broad portfolio covering potential conflicts between California and the federal government. California has built a strong frontline and made it clear that it will #RESIST!